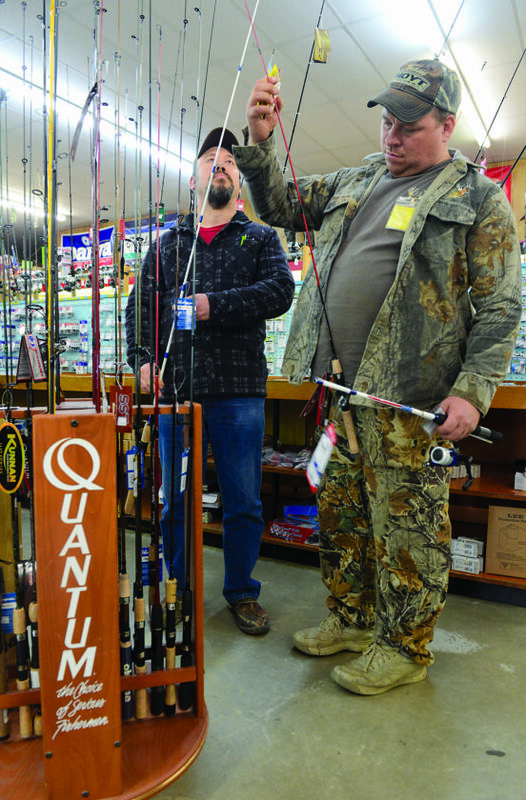 Mirror photo by Gary M. Baranec Casey Lucas (left) and Chris Johnson of Glen Campbell stock up on fishing supplies this week in preparation for the first day of trout season. Heavy snow flurries filled the air at the Pleasant Valley Boulevard Shopping Center early this week, but fishermen who stopped by the sporting goods section at Unkel Joe’s Woodshed to pick up supplies for Saturday’s opening day of trout season for Blair and surrounding counties knew that better days are ahead. Although most of this spring has been frigid and unpleasant, the weather forecast is calling for a marked warmup for this weekend, with temperatures expected to be in the 70s for Saturday. Bob Shuma, 70, of Altoona, agreed that favorable weather conditions make a difference. Shuma characterized himself as “a trout fishing nut” and said that he fishes the entire year around. During the winter months, Shuma often fishes wild trout streams like Spring Creek near State College and the Little Juniata River, but this year’s harsh winter and early spring weather has played havoc with his plans. “If it’s nice in January, I’m out fishing, but I’ve only been out three times this year,” Shuma said. Bob Williams, 53, of Altoona, plans to fish Canoe Creek on Saturday with his wife, Thelma, and their grown daugther, Amber Miller. A family friend, John Knox of Altoona, will also be in the Williams’ fishing party on opening day. Williams said that he planned to arrive at the stream very early on Saturday. “We usually get there at 3:30 (a.m.), so that we can get a spot,” Williams said. Due to all the recent precipitation, whether the water levels in area streams for Saturday’s opener are as accommodating as the temperature remains to be seen. Jim Burley, 59, of Coupon, took advantage of the early March 31 trout season opener in 18 Pennsylvania southcentral and southeastern counties to fish the west branch of the Conococheague Creek near Fort Loudon on the first Thursday in April. Burley said that the water levels of the Conococheague were quite high when he was fishing that stream. Big crowds on opening day are often as unpleasant as bad weather for some fishermen. Burley said that he might not even fish this Saturday because of the anticipated heavy crowds. Shuma, however, relishes the heavy opening-day fishing pressure. He expects an elbow-to-elbow crowd at Whipple Dam State Park, but he says the more, the merrier. Opening day: The regional trout season opened Saturday, March 31 at 8 a.m. in 18 southcentral and southeastern counties throughout the state. The official opening day for the rest of the state, including Blair County, Cambria County, Huntingdon County, and Bedford County, is 8 a.m. this Saturday, April 14. Minimum legal size: 7 inches. Fishing hours: 24 hours a day, after the opening day. Creel limit: Five per day, combined species, during the regular season, which starts Saturday and runs through midnight on Labor Day, Sept. 3. Three per day, combined species, in approved trout waters only, during the extended season, which begins on Sept. 4 and ends at midnight on Dec. 31. License requirements: All fishermen ages 16 and older must possess both a valid 2018 Pennsylvania fishing license and a trout/salmon stamp in order to fish for trout. Licenses are valid through Dec. 31 and are available at issuing agents statewide. License fees: Licenses cost $32.80, including $9.90 for a trout stamp, for resident fishermen ages 16-64. Senior resident fishermen ages 65 and older can purchase an annual license for $11.90 plus the $9.90 trout stamp, or a lifetime license for $51.90 plus the $9.90 trout stamp.